The El Camino was introduced on October 16, 1958 to compete with Ford’s popular Ranchero. While the El Camino was radical in design, it was a new play on an old idea. For years, farmers in Australia had been using vehicles called Utes to tote goods and equipment back and forth from farm to market. Allegedly this came about in the 1930s when a woman wrote a letter to Ford Australia asking for a vehicle that could “carry them to church on Sunday and take the pigs to market on Monday.” This simple request eventually led to Ford’s creation of the Ranchero for U.S. markets, and the El Camino followed two years later. 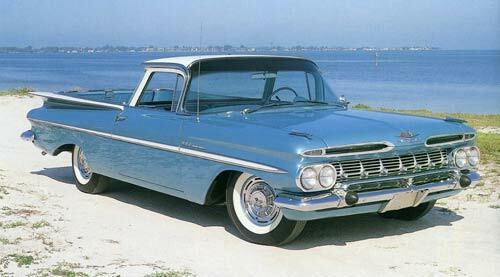 When it was introduced, the 1959 El Camino was a conglomeration of several GM cars. The car was based on the Brookwood 2-door wagon, the exterior trim was that of a Bel Air, and the interior was borrowed from the Biscayne. 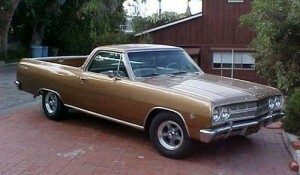 The El Camino was also billed as the first Chevrolet pickup to have a steel bed floor rather than wood. Interestingly, the steel bed floor could be removed, revealing the rear portion of the Brookwood floor pan, foot wells included. After the relative success of the Elky in 1959, it had a rough time in 1960. The previous year the El Camino sold just over twenty-two thousand units, eclipsing the Ranchero both in 1959 sales and its 1957 debut. 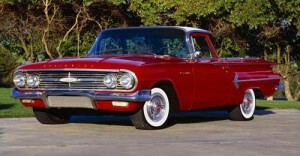 Chevy redesigned the El Camino for 1960, but sales plummeted with only fourteen thousand units sold. After once again seeing the success of the Ranchero– newly redesigned on the Falcon platform– Chevy decided to close the books on the El Camino. The El Camino thundered back onto the scene in 1964, riding on the new, redesigned A-body platform. 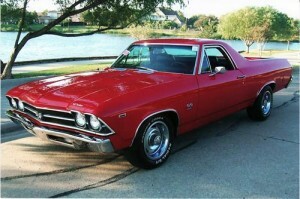 Even though the El Camino originated on the Impala line, it turned out to be a hit based on the Chevelle. 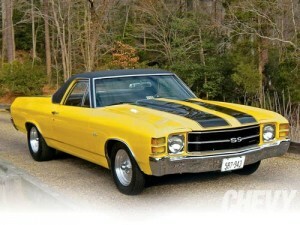 Sharing the underpinnings of the new Chevelle, the El Camino was poised to enter the muscle car arena. This would have to wait though, because the most powerful 1964 Elky models only came with a 300 hp, 327 cubic-inch V8. 1965 saw a redesign for the Chevelle and El Camino, and because of the peak in the center of the grille, overall length was increase by 2.5 inches. This year would see a couple of new options, including AM/FM radio and a 350 hp, 327 cube V8. This was a good start in the performance department. Seekers of high horsepower wouldn’t have to wait long though, and Chevy hinted at this with their 396-powered El Camino roadster that toured the auto shows for 1965. 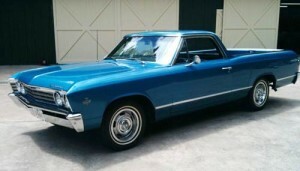 Once again, Chevy decided to redesign the El Camino for ’66. Although the underpinnings were pretty much the same from the ’64-’65 models, the ’66 had completely new sheet metal below the beltlines. The truck also received several new features, including a new instrument panel and shoulder seat belts, but these were overshadowed by the might of the 396 cube big-block V8, finally made available this year. This engine could be had in 325 hp or 360 hp versions, producing 410 lbs-ft and 415 lbs-ft of torque respectively. Yet again, Chevy decided to make some appearance changes to the Elky. It seems yearly redesigns were the trend for the Chevrolet of the ’60s. 1967 models received a new grille and front bumper, as well as an optional vinyl roof. Air-adjustable shocks were available and were installed on the El Camino for the first time this year. (Air-adjustable suspension was available on the 1959-1960 models, but sales records give no indication these were ever actually installed on an El Camino.) This allowed the rear suspension to be leveled out when hauling a load. A new generation of the El Camino, along with the Chevelle, was introduced to the public for the 1968 model year– and it was a hit right away. 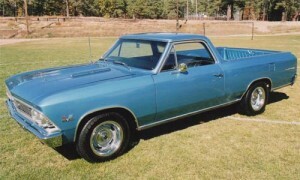 Sales for the previous generation consistently hovered around 35,000 units, but the 1968 model sold nearly 42,000 units, ushering in an era of the highest El Camino sales ever. The wheelbase shrank from 119 to 116 inches and the sheet metal was completely new once again. The biggest news for the El Camino was the introduction of the coveted 375 hp, 415 lbs-ft L78 396 big-block– the highest horsepower engine ever available in an El Camino at that time. For the first time since its introduction in 1959, the El Camino kept the sheet metal from the previous year, with only minor exterior changes like the new front bumper and the back-up lights, which were relocated to the tailgate. The SS396 became an option on the Elky, rather than its own model, and included extras like power front disc brakes and a unique hood. Although the El Camino received new sheet metal from the firewall forward, the biggest changes for 1970 were under the hood. The 396 moniker stuck around this year, but all the 396 cube engines were bumped up to 402 cubic-inches, although horsepower did not increase. Big news for this year was the introduction of the ground shaking LS6 454 ci V8. 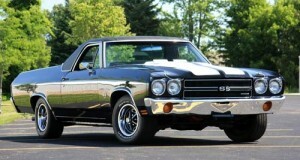 With 450 hp and 500 lbs-ft on tap, the LS6 cemented the El Camino as one of the kings of the muscle car era. With an available Turbo Hydra-Matic transmission or close-ratio four-speed manual transmission, the LS6 powered El Camino could devour a quarter mile in 13.44 seconds with a 108.17 mph trap speed. The end of the muscle car era was in sight and Chevy knew this. Most engine options were detuned in 1971 and the LS6 454 disappeared completely. For those looking for high performance kicks, the LS5 454, no slouch in its own right, carried over from the previous year sporting 365 hp and 465 lbs-ft of torque. 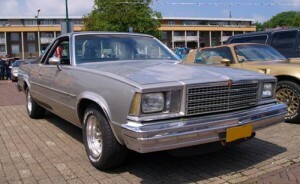 Both Chevelles and El Caminos of this year featured a single headlight, similar to the recently introduced Monte Carlo, although the marker lights were in a different location. 1972 is often considered to be the end of the muscle car era as the following year would usher in the gas crunch of the 1970s. This year, GM mandated that all their engines must report net horsepower ratings. This meant all the advertising to the public must be done with the much lower numbers generated by the net testing, which included accessories and emissions equipment. Net horsepower ratings fell to 270 hp/390 lbs-ft for the 454 ci V8. The Super Sport option became a trim package only this year, becoming available on all V8 El Caminos, even the paltry 130 hp/230 lbs-ft 307 ci V8! The redesign in 1973 created the largest El Camino ever produced, coming in at nearly eighteen feet long, six-and-a-half feet wide, and four-and-a-half feet tall. Many improvements in ride quality were made this year, including clearance for extra spring travel and computer-selected coil springs. Front disc brakes also became standard. There was an option for swivel front bucket seats and the gauge cluster was new, both of these being borrowed from the Monte Carlo. 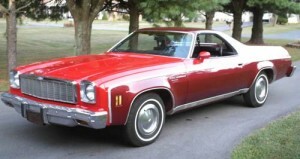 Even though performance was lacking (the 115 hp 307 V8 was the base engine), the public loved this El Camino and Chevy sold 64,987 units–making the 1973 El Camino the best selling ever. Not much changed for the Elky in 1974. There were minor changes like the front bumpers and a wide, Mercedes-inspired grille, but for the most part, appearances didn’t change. The El Camino Classic, based on the Malibu Classic, was introduced this year, becoming the most luxurious, top-of-the-line El Camino available. 1974 also saw the introduction of the 400 ci V8, which shared power plant duties with the 350 and 454 V8s. A new grille and a new base engine came about in ’75. The base engine became a 105 hp/250 ci inline 6 cylinder. Horsepower for the top flight engine, the 454 V8, fell to 215 hp. This would be the last year the 454 would be offered . 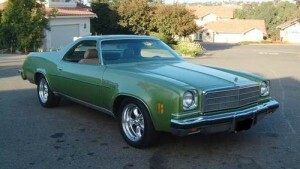 Once again, the top model for 1976 was the El Camino Classic. For this model year the Classic sported stacked quad headlights, while the base model still wore the dual round taillights from the previous year. The base six cylinder engine carried over from 1975, and a 140 horsepower 305 ci V8 was added to the line up. 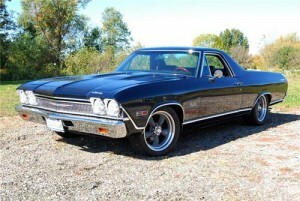 This gave the El Camino five engine options, including a 350 cube V8 with either a 2-bbl or 4-bbl carb. 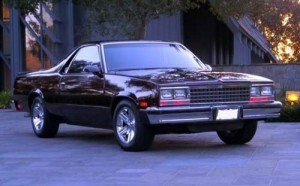 All El Caminos this year would come to sport the stacked headlights used on the El Camino Classic in ’76. Chevy once again downsized the engine lineup, dropping the 400 ci V8 and making the 350 the largest available. By this time, all V8 El Caminos were equipped with Turbo Hydra-Matic transmissions making the 250 ci I6 the only engine coupled to a stick shift. 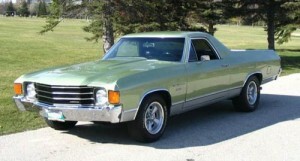 The El Camino Classic would continue on as the top-of-the-line model, as 1977 gave way to a new generation of El Camino in 1978. Not for the first time in its life, the El Camino became a conglomeration of other cars. This time the front sheet metal came from the Malibu, the doors were borrowed from the Monte Carlo, and the tailgate came straight off a Malibu wagon. For the first time all of the Elky’s sheet metal was bolted to its own, unique chassis. 1978 models were available in four trim levels; Black Knight, Conquista, Super Sport, and Classic. The base engine became a 3.3 liter V6, and two engines sat above that– the 145 hp 305 and the 170 hp 350. 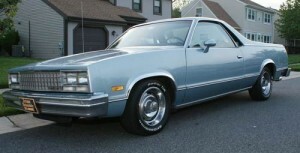 There were few changes to the 1979 El Camino after the introduction of the all-new ’78. El Caminos wore more trim this generation, but sat on a one-inch longer wheelbase, coming in at 117 inches. A new engine was added to the ’79 lineup; the short lived 267 ci V8. This engine sat between the 3.3 liter six banger and the 305 V8. The Black Knight trim package was given the name Royal Knight in 1979, but otherwise stayed pretty much the same as the previous trim package. This package would stick around until being axed by Chevy in ’84. The El Camino brought in the ’80s with virtually no change to the body or chassis. There were some minor engine changes for the new year, however. The base engine jumped from 3.3 liters to 3.8L for the V6. The 267 V8 stuck around this year, but the 170 hp 350ci was let go. Nearly all El Caminos this year came with a three-speed Turbo Hydra-Matic transmission. A new grille was introduced, but otherwise the ’81 model shared much with the previous year. The engines from ’80 all stayed the same, but now sported Chevy’s Computer Command Control emission system. This further robbed the already disappointing performance of the El Camino, with every engine in the line up losing horsepower. 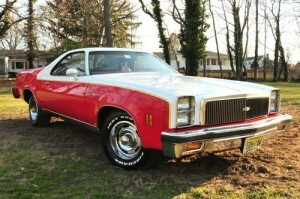 The El Camino of the 1980s was a far cry from the superstar it had been in the ’60s and ’70s. In 1982, GM decided they were moving the A-body platform to an all-new front-wheel drive configuration, necessitating a move for the El Camino to another platform. 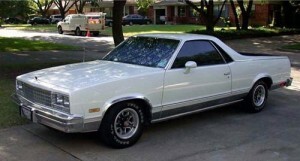 Along with the Malibu, the El Camino found a home on the G-body platform with the likes of the Buick Regal, Oldsmobile Cutlass, and Pontiac Grand Prix. There was also a diesel 350 available for the first time in an El Camino, although they would come to garner a bad reputation due to poor service history. The 267 V8 was dropped in 1983, and the new base engine was a Chevrolet-sourced 3.8L V6, rather than the Buick 3.8L used up until 1982. Rounding out the engine lineup were the 305 ci V8 and the 350 ci diesel V8. This was the last year for the El Camino’s cousin, the Malibu. 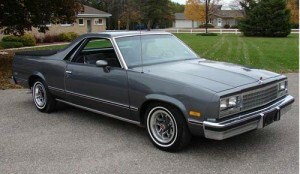 After ’83 the El Camino would be one of the last holdovers from the bygone muscle car generation. Beginning this year, the El Camino SS was offer through a joint venture with a Chattanooga, TN based company called Choo Choo Customs. These models feature the same front clip as the Monte Carlo SS, but did not receive the higher performance engine. Instead, the Choo Choo El Camino was stuck with a 305 ci V8 that put out just 190 hp. Production of the 1985 model El Camino began in Mexico and it would continue to be produced there until the end of the Elky in ’87. This year also saw the introduction of the 4.3L V6, a legend in its own right, as the base engine. Everything stayed the same for the ’86 model year, being a carryover from 1985. There would be few changes to the El Camino once production began in Mexico. After more than 25 years of production, the El Camino was finally laid to rest after the 1987 model year. The engine choices had been pared down to just two; a 145 hp 4.3L V6 or a 150 hp 305 ci V8. This would also be the last year of the Choo Choo Custom El Camino, which never did receive the high-output V8 from the Monte Carlo SS. For the 1988 model year, the G-body platform was dropped and most of the cars were moved to the front wheel drive W-body platform. 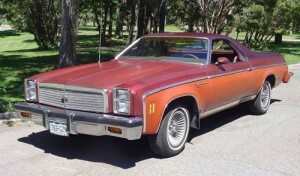 It should be noted that some sources say there were 420 unsold 1987 El Caminos which were retitled and sold as 1988 models, although production officially ended in 1987, all models were rear-wheel drive. I wish they would come back with a new El Camino with the front end of the new Transverse or the full size Impala’s, that would be awesome. 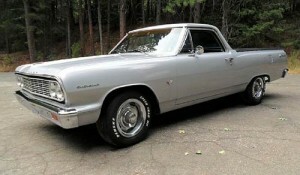 For the last couple of years I have heard that Cheverlet was going to come out with a new El Camino. I own an ’84 and I love the smell of El Camino in the morning. 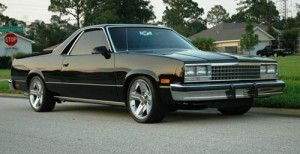 I have owned a 1983, four 1986 & three 1987 El Caminos over the last 20 plus years. I’m keeping the last black & silver Elco which has been the best one & it has 220,000 miles on it. With bigger & wider tires, coil over shocks in the rear and a tonneau cover over the bed, they make a great daily driver. 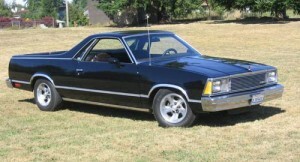 Why doesn’t Chevrolet make a modern version of the El Camino, but not the Ute made by Holden. The roof line doesn’t fit the rest of the truck. Do you still have the SS for sale? I have a 2015 El Camino on a 1978 body. 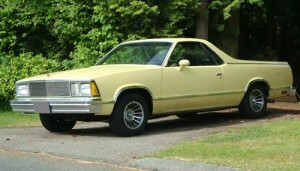 I have a friend who has a 1983 el camino that he needs to sell. It was running when he parked it. It is rough on the inside. The body is in need of a paint job. He was driving it until last December. Price is open. Location is in Southern Nevada. Anyone interested?